What better thing to do before appearing on NBC G4-TV’s popular international live television show Attack of the Show! than test the machines cleaning the air as we have done since the Fukushima Daiichi triple meltdowns began devastating Japan March 11, 2011. The producers of the program asked if I could bring a few samples to illustrate what we have been doing over 13 months that the American and Canadian governments stopped doing long ago – checking for Fukushima fallout contamination in North America. First establishing background in a ten-minute average, the ambient air registered 45.8 Counts Per Minute (CPM) which, as noted before in prior posts and in radio interviews, is high for the Los Angeles Basin’s relative geology and elevation. Typically, radiation backgrounds at sea level and on an alluvial plane will be in the 12 to 15 CPM range. Above ground nuclear tests at the Nevada Test and Training Range are not generally considered as big a factor in ambient L.A. air radiation as most of those “shots” were downwind of America’s second largest metropolitan area. California and the Pacific Northwest therefore only have about half the amount of radiation from shots than all points east of Nevada. The high background here may be from the multiple experimental nuclear reactor partial meltdowns at the Santa Susana Field Laboratory, commonly known as Rocketdyne, high in the hills between the Simi and San Fernando valleys. This reporter began covering Rocketdyne in 1998 for Los Angeles magazine two years before acquiring an Inspector Alert nuclear radiation monitor. Shocking even this reporter, the aggregate dust of three HEPA filters in Radiation Station Santa Monica clocked in at 746% of background radiation or 7.46 times normal. This high reading, pictured here after a ten-minute test, is over double the level that the California Highway Patrol considers a hazardous materials situation – three times background. The detection also trumped our last ‘highest’ Los Angeles air reading taken after 42 days use of two HEPA filter machines on March 7, 2012. That dust measured then came in at 6.68 times background. 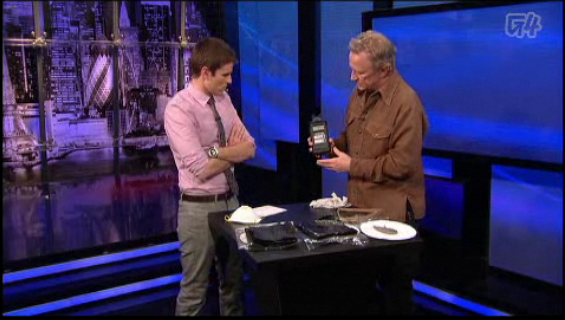 Carefully collecting the dusty debris, this reporter took the sample to Attack of the Show! knowing that it would be a good example of the challenges of dealing with Fukushima meltdowns radiation in something as critical as the air we breathe. Prior to the show, which is filmed in the Miracle Mile of Los Angeles, the background of the studio hovered in the low 20s CPMs. 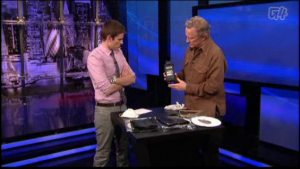 Checking out the detritus, live on air, the Inspector Alert immediately began registering additional radiation and surged to 80 CPM before moving on to the next item to test, Japanese seaweed. That’s nearly four times background in a quick spot check. It is going to be a long hot summer in Southern California as these high numbers indicate. The only silver lining to this foul air scenario is that Radiation Station Santa Monica’s HEPA filters captured these alpha and beta radiation particles before they could be inhaled or ingested. That may be little consolation for the millions of Southern Californians barely aware of the continuing and growing threat of fission products flowing through the ocean and floating in the air towards the West Coast. The effects of Fukushima fallout and Pacific pestilence can be mitigated by the use of HEPA filters in the home, office and motor vehicle. As we’ve continued to report in “Eat Me,” reducing one’s bioaccumulation of radiation is crucial to keeping one’s chances of contracting cancer to as low as possible. If I remember correctly, the nuclear physicist and author, Dr. Caldicott, stated that the incubation period for hot particles in a person’s body to turn into cancer is roughly two to three years for certain types of cancer, and 10 to 14 years for other types. Does anyone have hard data on current rates of leukemia, bone marrow cancer, thyroid cancer, lung cancer, etc. Are there spikes in such stats in Japan and, say, the West Coast of North America? It has been almost exactly three years since the Fukushima incident. We do not eat any thing with wheat in it. Finally My son takes a bath every night with epson salt and baking soda. I make him soak his trunk for at least 15 minutes. I don’t know if that will help anyone but I hope it does. We must unite and educate ourselves and each other. Thank you for all your research and attempts at informing the sleeping public. Does anyone have any info on Icelandic and Norwegian fish? Dr. Maulfair pointed out the fact that we have a great deal of information regarding expose to radiation from various sources but none we have found concerning the ingestion of radioactive food. Here we go, making science as experimental animals. Check out our website for actions on a personal basis – radiation is accumumlative so lowering body stores is important. 1. Thanks to Collins’ for the webcasts. I followed them extensively for several months after the tsunami. 2. Peculiar. He uses rubber gloves to open the plastic packages (which only shield him from the relatively harmless alpha waves, for those thinking to protect selves from ionizing radiation by wearing rubber gloves), then he wipes the dusty (radioactive dust?) on his pants before removing the gloves……very curious. Glad he let it slip that the gloves were to protect the METER from contamination. My point is, if all this is coming from Fukushima, why are the exterior readings half of the interior 55 year old toilet reading and the same or less than the kitchen readings? I bought my first Geiger counter @ 2000, because I was constantly muscle testing radiation in fertilizers and pesticides and needed to check my readings. The last 10-12 years I believe there have been radioactive iodine and metals in chem trails. Muscle testing of Collins’ samples indicates to me that the dust contains radioactive particles of the types I see in chem trails, 2010-2012, every day. The seaweed looks to me like the radioactive particles are from dessicated red blood cells I routinely find in chem trails. Indeed (Los Angeles area, Collins is in Santa Monica, a suburb of LA), these appear in the onshore moisture layer as brownish clouds forming over the ocean and coming ashore at night, 2010-2012. Since before Fukushima, I have rarely found seaweed clean enough to eat. 4. When a town @ 20 km NW of Fukushima was evacuated because of elevated ground water radiation, I was puzzled. Ground water in Japan moves SE to NW at a rate of 20 km in less than a month? I had a friend in Japan forward to me the town website. From the photos taken long before the tsunami, it looked to me like the town was radioactive long before 3-11. There is now clouds all around the USA. You can see it on NOAA radar as well as college of dupage radar. They have been there almost 2 weeks. They have gone from black to Polonium blue. Click on loop to see them grow and subside but not move with the clouds. Radon and Polonium are Isotopes of Uranium 238 and glow under radar. Polonium glows blue. Since the EPA spike of June 7th, 2012 these clouds have grown and changed color to blue. They do not move with the weather. I have screen shots of NOAA radar since 6-13-2012 when I found out about them. 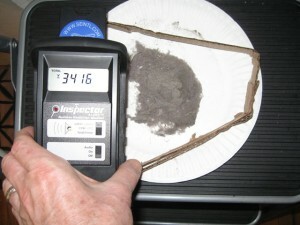 There was also a spike on the Radon chart Indiana and Ohio area of up to 16 PCI http://www.radon.com site. They onlu change the readings once a month 16. Ck on the Radon readings. College of Dupage radar is weather.cod.edu Click on the map then click on area and hit .5 degree loop. Martin Young Coventry,ct. If you want the screenshot and the movies I made of the loop I can provide them. .154 uSv/hr., in June of 2011 it was more like .100 uSv/hr. seams to be climbing at a steady .001 uSv/hr per month right now. We had the high spikes in mid Dec to late January, running in the high .400 uSv/r to as high as .728 uSv/hr in Downtown Vancouver Canada. thought the meter had a problem so sent of to get it checked… it was fine.. . I see plenty of readings in the .200 – low .300 uSv/hr show up. and as low as .064 uSv/hr. But I did get one single spike 5 days ago that registered .628 uSv/hr on a half second reading. finally confirmation that my readings in Dec/Jan were correct. thank you.. Mr Collins. 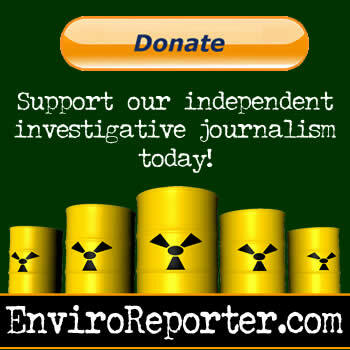 EnviroReporter can release my E mail Mr Collins if there is an interest. When someone gives you an hourly exposure rate you need to multiply that by 24 hours and then 365 days to get your yearly rate of exposure. I chalked it all up to stupidity for awhile. But then I thought, most of the people pushing for these destructive technologies are pretty well educated, some even went to Ivy league schools… so much for a better education creating a better society! lol. Better education does NOT equal a better world. I think we can put that ridiculous and FALSE argument to rest now. Apparently these well educated millionaires and billionaires think their money is going to save them from the contamination that’s just moments away from affecting the entire globe and not just one bloody hemisphere. Most of these institutions of ‘higher learning’ it seems, poop out people who’re short on nothing but common sense and good judgment, oh, and basic human consideration. What a shocker. Contrary to popular belief, money won’t buy you LIFE. Just look at vegan billionaire Steve Jobs. Despite all that money he spent over the years to treat his illness, it took his life anyway. Think about it. I was certain this problem wouldn’t receive any national attention but with networks like G4 added to the mix, there’s some hope that your ‘average’ head-in-the-sand Americans will take notice. I don’t know how much difference it’ll actually make but more people being informed is never a bad thing. A big THANK YOU to everyone working to get information out there. Ditto on not eating fish anymore. I started limiting my seafood consumption after the Gulf oil disaster, at this point tho I’m swearing off ALL seafood. The seafood company’s have been caught lying about the sources of their catch, among other things. So much marine life is suffering repercussions from all this contamination. The ocean is so screwed…. goodbye seafood, and ocean life in general. Everything’s looking pretty grim and dire. I just can’t see how the environment’s going to rebound from something this severe; at least not in MY lifetime. And reading some of the news coming out of the communities in and around Fukushima, my God those poor people. They’re all experiencing the same symptoms; irritation in the throat, chronic nosebleeds, diarrhea, fatigue. It’s all the same and it’s by the thousands. I used to know a woman who lived in New Jersey and her community was located within blocks of a Nuclear plant. The ENTIRE community had all those symptoms I just listed. The woman asked me one day, “What do you think’s causing these symptoms?” I was incredulous that she, someone I considered a very intelligent person, would not put two and two together. Either that or it’s typical headinthesand America. @charlie; I wouldn’t touch fish with a ten foot fishing pole! Not only Japan, but also the Gulf is finding shrimp without eyes, and deformed crabs from the Corexit and BP spill. I used to love my tuna! I just have to kiss it good-bye. Watch the Japan factory fires filled with uranium storages today. Get those Japanese produced Hepa filters running… irony intended. This video will leave you amazed that we are being led down the Uranium Yellowcake Brick Road by the nuclear industry so they can keep the plutonium and DU byproducts gravytrain running us headlong toward our graves. I guess cancer rates are due to increase as well? A friend of friend in Korea decided to test her hepa filter. It was running for a week beside here 12 month old baby..It came back at 1.5 millisievert! It turns out that the Korean company that sells the filters in Korea has told us that all air filters are processed or manufactured Japan. The main point of the air filter story was tell the people to use HEPA filters but please check where the filters are made or manufactured…. I guess even in Austalia, east coast at least , its better not to eat fish? Not a single Government agency is reporting ANY numbers to challenge these findings….so, I guess they are 100% accurate! Amazing! We are so screwed. We breath air every minute and that radioactive dust is waiting to be ingested ….it’s covering everything in the Northern Hemisphere! Think of a nuclear plant as man’s attempt at building a piece of Hell. Sure it’s powerful but, it turns on it’s creators and kills everything it touches! With power comes great responsibility….not with this gang! Once again, Man proves he ranks TOP of the “self-destruction list” because, even slime doesn’t create extinction-level technologies!